6th victim: Ashlei Ayres was among 14 people on the boat. Police have released the name of the sixth victim of yesterday's fatal boat crash on Sydney Harbour. The woman's name was not released before because her immediate family had not been informed of her death. Her family says she will be deeply missed by friends and relatives. Six people on a runabout died after it was hit by a fishing trawler off Bradleys Head just before 3:00am (AEST) yesterday. The other people who died were 20-year-old Sydney bartender Elizabeth Holder, 21-year-old Stacey Wright from Wollongong, 25-year-old American Darwin resident Jessica Savanna Holloway and 22-year-old Sydney barman Alex Rumiz. 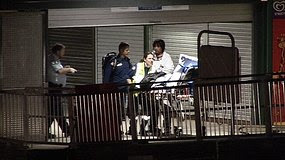 Twenty-nine-year-old Alex Nikakis died in Royal North Shore Hospital last night after suffering a critical brain injury. Police are still waiting to talk to the man who they believe was driving the small boat, but the head of the Royal North Shore Intensive Care Unit, Doctor Ray Raper, says he is not in any condition to talk. "He's suffering all the problems that one would expect for a young man who's been involved in a tragic accident and lost a number of his friends and colleagues and so on," he said. Marine Area Commander Superintendent Mark Hutchings says it is too early to say if anyone will face charges over the crash. "The investigation is moving forward, I can say that, but at this point in time we're not going to get down into that detail," he said. He says the crash underscores the need for recreational boat owners to take more care on the Harbour. Police have now also interviewed three fisherman who helped to rescue a number of people involved in the crash.